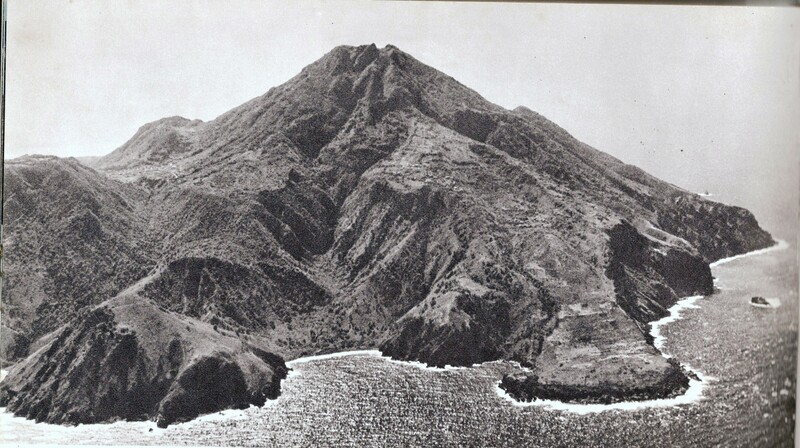 A view of Saba from a plane passing over in the nineteen forties. When these islands were being fought over by various European powers there was quite some correspondence between the islands and the colonizers in Europe. Lots of this correspondence still survives in the archives in England and other countries and makes for interesting reading. Here is a report from November 22, 1675 with answers to inquiries sent to Colonel Stapelton, Governor of the Leeward Islands, by Command of the lords of Trade and Plantations by Sir Robert Southwell. 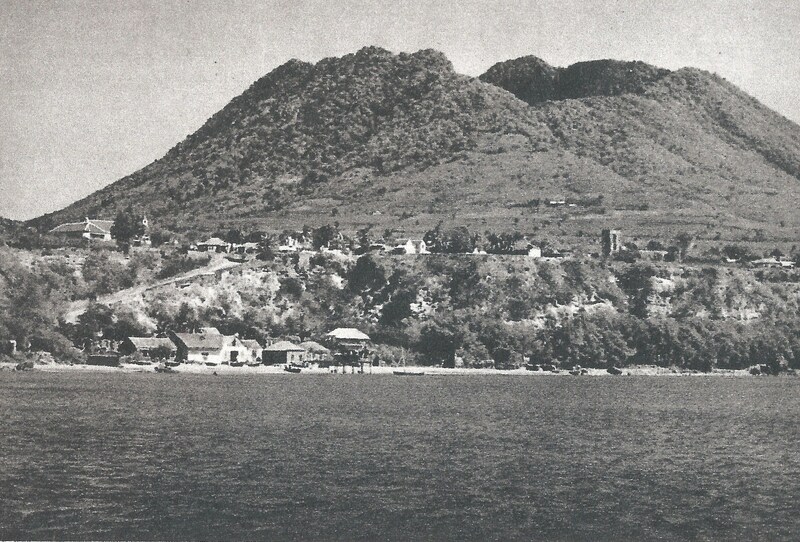 A view of the historic island of St. Eustatius or Statia from the nineteen forties. Sir William Stapelton established a Federation for the Leeward Islands in 1674 with one Governor for the Leewards and a Lt. Governor for each island. It was active from 1674 to 1683 and because it was unpopular changes were made. The General Assembly met regularly until 1711.The islands referred to in this report and belonging to the British were, the middle part of St. Christopher’s (the two extremes of the island belonged to the French), Nevis at the time the most important island, Antigua, Montserrat, Barbuda, Saba, Statia and Anguilla. A Council in each island, in number twelve, where persons enough to be chosen, but in most of the islands, except Nevis, there cannot be twelve, not being half populated. An Assembly composed of two freeholders from each parish, yearly chosen. Monthly courts of judicature in each parish, held by the Justice of the Peace, who is commissioned to Judge, with two or three members of the Council of Assembly as assistants, in causes not exceeding 1,000 lbs. of sugar, or 6l.5s.6d. Per 100 lbs., otherwise referred to the General Sessions, held twice a year by the Governor and Council. Recites the custom in Nevis since the infancy of settlement to this day. Courts of Judicature relating to the Admiralty. The legislative power is in the votes of the Council and Assembly, assented to by the Governor, who has a negative voice; laws so passed in force only for two years if his Majesty gives not his assent. The executive power in the Provost Marshal by warrant from the Governor, who also signs all executions, letters of administration, probate of wills, and licenses of marriage after publication made in churches. Many laws in force too tedious to be mentioned, some being frivolous, but those in force comfortable to the laws of England, and those of moment sent home. Two standing companies of foot in St. Christopher’s, which should be eighty in each company, besides officers, but now are only forty-nine in one company and fifty-four in the other, besides officers, and are in the greatest necessity ever soldiers were in, in sight of the French nation, whose soldiers are well paid, well-armed and accoutered. Seven companies of Militia, foot, English, French and Dutch, but little credit to be given to the aliens for all their oath. Nevis: only twenty-two in pay, and five gunners to guard the guns, a troop of sixty horse, ill-armed and horsed, because generally used to carry sugar. A regiment of 1,300, the Deputy-Governor Randall Russell, Colonel, Francis Morrison, Lieutenant-Colonel, Daniel Lanhather, Major, “sees” them all four times a month, when they are exercised; this country the worst for arms he has ever been in. Antigua: but two files of men in pay, a troop of 33 horse, a regiment of 770 foot, Colonel Philip Warner, Colonel, Lieutenant Colonel Rowland Williams, Major Thomas Mallett. Montserrat: but two files of men paid by the country in two forts, a troop of forty horse, a regiment of 877 foot, the Colonel, his brother Edward Stapelton, who is also Deputy Governor. Small number of people in Statia, Saba, and Anguilla, where Captain Abraham Howell is Deputy-Governor, with sixty men ill armed. In Statia and Saba four files of men, these islands of no advantage, but rather of disadvantage to His Majesty, being refuges for any who design fraud, and were better under water than above. In Barbuda some twenty servants belonging to those who have farmed the Island from Lord Willoughby for thirty years, they look after a considerable stock of horses, cattle, and sheep, which may in time be an advantage for victualing his Majesty’s ships, or the inhabitants of these islands. In Tortola good supply of timber. Describes the castles and forts within his government in St. Christopher’s, Nevis, Antigua, and Montserrat. Concerning the number of privateers that frequent the cost, their burthen, numbers of men and guns, &c. The number cannot exactly be given. The French have several at Hispaniola. The Dutch have had sixteen privateers last year in those parts, but none exceeded 25 guns; they much molested our merchants in the late war. Can name but few, Captain Barnes with 12 guns and 150 men, Captain Francis, a mulatto, with 12 guns and 60 men, William Hamlyn, who took a false oath against Captain Warner and ran away with a sloop from Antigua to Curacao; is informed Hamlyn is sent to Holland to be punished. The French and Dutch have considerable men-of-war every year, wars between them at Martinique, where de Ruyter landed soldiers. Whoever is master of the sea, and has good soldiers, from October to June, can carry or destroy the strongest islands. The strength of his neighbours, whether Indian or other nation: About 1,500 Indians in St. Vincent, Dominica, and St. Lucia, six hundreds of these bowmen are negroes, some run away from Barbados and Guadeloupe, 5,000 at Martinique, and 300 in the Grenada’s. Cannot tell the number on other islands plundered by the Dutch. At St. Cruce 600 men, and at Hispaniola upwards of 4,000. The Dane has no other Colony but St. Thomas with 30 inhabitants, they are but new planters, and have but two trading ships every year. The Dutch have a considerable fort at Curacao, and are settling Tobago where are 600 soldiers, in Surinam 600 inhabitants, but knows not their strength in other places. Cannot give account of the Spaniards and their Indians. Has not during the ten years he has been out seen any trade with the Indians. Trade between the Dutch and Spaniards for Negroes several thousand yearly. The French very considerable as to their trade and commerce. A view of St. Eustatius or Statia from St. Kitts. Statia from this point is only eight miles whereas the capital of St. Kittts (Basseterre) is 18 miles from this point. The islands are closer than we think. Colonialism has seemingly forever divided us in the Caribbean. We speak to each other via the colonial masters in Europe even those islands which are independent have to deal with us via a Dutch ambassador in Trinidad. The correspondence he keeps with his neighbours: With the Indians none at all, who are detestable for their villainies and barbarous cruelties. The arms and ammunition he found on the place, and has since received, and what remain. The money paid by His Majesty or levied within his Government towards buying arms, or maintaining fortifications and how spent. The boundaries, longitude and latitude, and land within his Government, number of acres patented, settled or unsettled, and manurable: Nevis contains by computation 320,000 acres, about 7 miles in breadth and 15 miles in length, 2,000 acres patented, the whole island settled, except the top of the mountain. Antigua, 28 miles in length and 12 miles in breadth, 120,000 acres whereof 100,000 acres manurable, whereof 70,000 taken up. About 3,000 acres in the several small adjacent islands. Montserrat, 25 miles in length and 8 miles in breadth, 60,000 acres, one-half not manurable because very mountainous, 20,000 acres patented, 4000 acres unsettled. Statia, Saba, and Anguilla never surveyed, fitter for raising stocks of cattle than to yield sugar or other commodities. Barbuda computed as big as Nevis, never surveyed, fit for cotton and indigo. The principal towns and places of trade, buildings, and their strength and size: In St. Christopher’s, Sandy Point, and Old Road, the places of trade, the buildings built ordinary of timber, covered with thatch, very few shingled. In Nevis, five places for trade, but two considerable; Charles Town, where good dwellings and storehouses, built with the country timber, not exceeding 60 feet long and 20 broad, story and a half, the “Hurri-Canes” having taught the people to build low. Morton Bay, where are but few houses, because ships ride at Charles Town and send their long boats to Morton Bay for lading. In Antigua, six places of trade, but only two very small towns; in St. John’s and Falmouth houses built as in Nevis. In Montserrat, three places of trade, Kingsale, Plymouth and the Road, trade and houses small; there were here some stone buildings, but the earthquakes having thrown them all down, they build with timber only except the boiling houses for sugar, which in part must be built of stone. At the time when Governor William Stapelton was in charge of the Leeward Islands colonies (Nevis, The center of St. Christopher, Montserrat, Antigua, Barbuda and Saba, Statia and Anguilla) Nevis was the most important island. 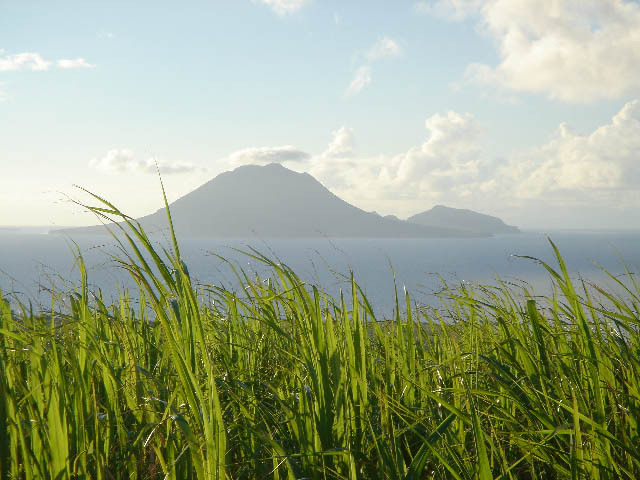 Here is a view of Nevis from St. Christopher (St. Kitts officially since Independence). In the Governor’s report of 1675 he said that Saba and Statia were of no advantage but rather of disadvantage to His Majesty, being refuges for any who design fraud, and were better under water than above. As to parishes, precincts, or divisions : In St. Christopher’s, six parishes or precincts , seven divisions, termed so from the divisions of the companies, for they are called such, a captain’s division; the precincts or parishes from the churches formally there erected and demolished by the French. In Nevis, four parishes or precincts, thirteen divisions, which take their appellations as before from such and such captains. In Antigua, six precincts, which are the places of trade, but one church, and that at Falmouth, which serves also for the Court House, their watching and warding against the Indians not admitting of their public buildings, divisions ten. In Montserrat, four precincts, and but two parishes, only two churches ever built, and those demolished by the French, rebuilt by the Governor’s direction on his arrival, but levelled with the ground, by a terrible earthquake on Christmas Day,1672, “ and had the people been in the afternoon at church they had been knocked on the head.” In some houses persons were killed, as in his own “it is beyond my purpose to express the miraculous escape of my own family and others.” Ten divisions from the names of the captains. The other islands were never divided into any parishes or rules. The rivers, harbours, and roads: Six rivers in St. Christopher’s, and two roads in the English part. In Nevis, three rivulets, and “a very good hot bath,” but one road, the best in all these islands. In Antigua, two rivulets, four good harbours, and many a good road, bay, and creek, all named. In Montserrat, twelve rivulets, whereof three hot at their springs. Four waterworks for making sugar, and might be more if the island were well settled and encouraged. No harbours but three good roads, several good bays of depths for the best ship in the world. In Barbuda, Statia, Saba, and Anguilla, open roads, no rivers or harbours. 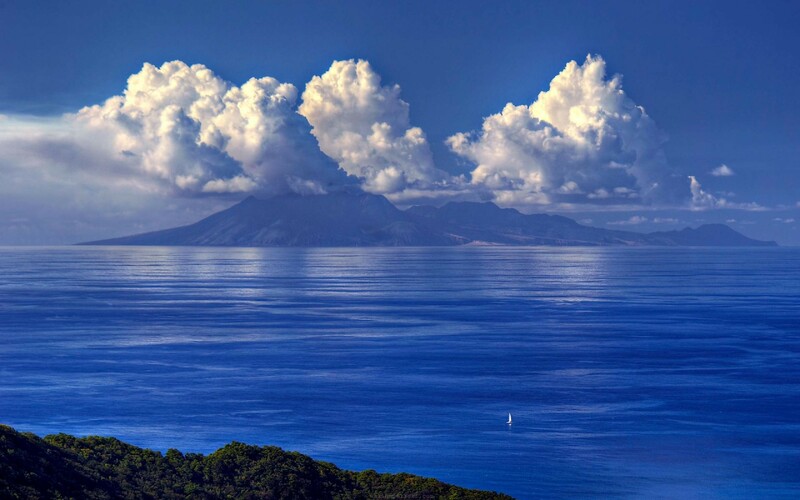 The beautiful island of Montserrat as seen from Nevis. All of the islands in the Leewards are within view from the other islands. From where I live on Saba, on a clear day I once saw Antigua, and usually I see St. Martin, St. Barth’s, St.Eustatius, St. Kitts, Nevis and on a clear day about five times a year I can also see Montserrat from my home. Commodities of their own growth or production, and their value also of imports: Sugar, tobacco, indigo, cotton, and ginger; about 3,600 tons of sugar exported directly for England, and not more than 40 tons to New England, New York, and Virginia. Very few materials growing, or can be produced for masts, white and red cedars. Imports of the manufacture of England to the value of 50,000pound sterling, and wines from Madeira. Servants, horses, and provisions from Scotland, Ireland, and New England about 20,000 pounds. Sterling. Knows not of any store of saltpeter, but what Colonel Philip Warner has in cave in Antigua; questionless there are saltpeter, Sulphur, and other minerals in most of the Islands. The number coming yearly to plant the last seven years and blacks or slaves brought in: No register has been kept, there are no foreigners except in St. Christopher’s, the number of blacks cannot be given for the same reason; the rates different according to their condition; from 3,500 to 4,000 lbs. of sugar given to the Royal Company’s factors, no certain rate but as agreed, from 20 to 22 pound sterling. The number of marriages the last Seven years: Shall advise with the Council of a method in future to enable a satisfactory answer to be given. The number of deaths: No register kept of burials. As to the value of the estates of Planters and the wealth of the islands in general: Reasons why no true estimate can be given: they generally conceal the number of their Negroes because levies are made for public charges per poll, yet, as near as may be, in St. Christopher’s 67,000 pounds, Nevis 384,660 pounds, Antigua 67,000 pounds, Montserrat 62,500 pounds, Statia, Saba and Anguilla 1,000 pounds., Barbuda 2,500 pounds. ; by a conjectural estimation the wealth of all is 584,660 pounds sterling. The number of vessels trading yearly and their burthen: About 100, from 15 to 200 tons, besides ketches and sloops lading from one island to another. Obstructions to improvement to their trade and navigation: The want of a constant supply of servants from England, Scotland, and Ireland; the want of men-of-war; how the French are supplied; has not so much as a sloop to go from one island to another, but has to hire to his great charge. Copy of the King of France’s Order to the Marquis de Granee on this subject. 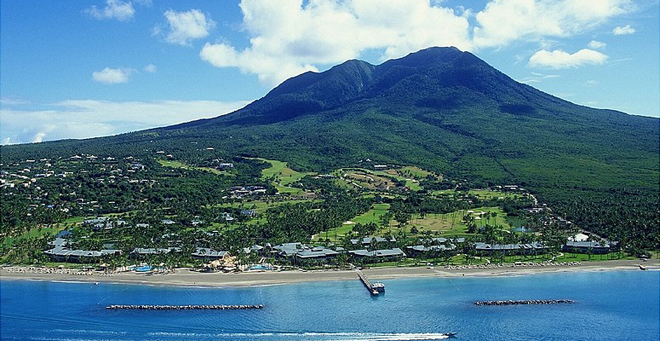 The island of Nevis. At the time of Governor William Stapelton, Nevis was the most important colony. 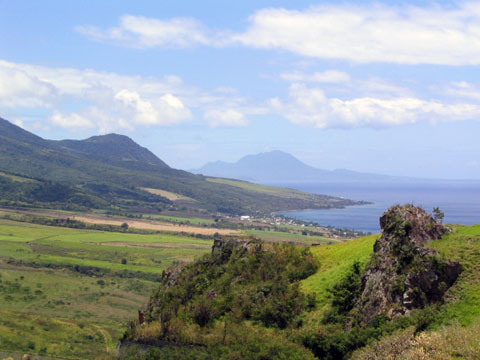 St. Kitts for only the middle part belonged to the English, and the two extremes of the island belonged to the French. Governor Thomas Warner who settled St. Kitts for his country in his dealings with the French claimed that he would rather have TWO devils for neighbours than ONE Frenchman. The advantages or improvements to be gained in their trade and navigation: A constant supply of servants and men-of-war; he building of a strong fort in each island. The French and Dutch have extraordinary care of their plantations. The Dutch now going to settle Tobago. Duties payable on goods exported and imported: No duties except the 4 and one half percent upon all goods; impost of 200lbs. of sugar per pipe upon Madeira wines, Spanish and Portugal, and of 50 lbs. per hogshead on French wines. Up until this day the Anglican Bishop of Antigua has Jurisdiction over the Anglican churches on Saba. 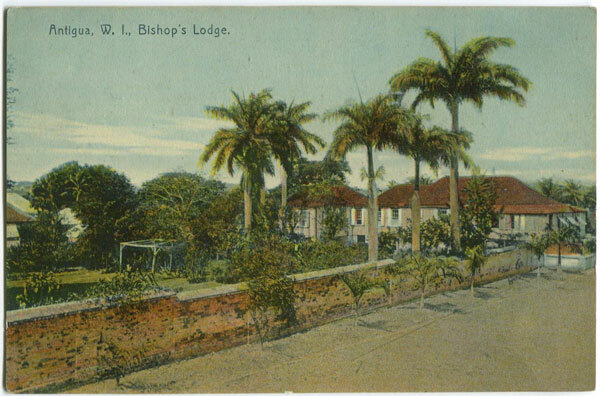 Before 1860 all of Saba was Anglican.Philip Warner the Governor of Antigua and son of Governor Thomas Warner who settled St. Christopher for England, also had a brother named “Indian Warner”. When “Indian Warner” and his fellow Caribs from Dominica raided Antigua they took Philips wife and others hostage. Philip later went to Dominica, invited his brother on board his ship and murdered him. The revenue arising to His Majesty: No revenue but the four and a half percent already mentioned. The religion most prevalent: The Protestant most prevalent or professed in all the islands, the generality of the inhabitants being all Protestants, the Common Prayer and Divine Service being read every Sabbath. In Nevis, are some few Quakers, and in Antigua are sixty; in both islands as many various religions as at home, but most frequent the churches when they like the parson or a fit of devotion comes upon them; cannot tell the variety of their religions. In Montserrat most part are Roman Catholics, it being first settled by those of that persuasion, yet they give no scandal to the Protestant Church, which is the prevalent persuasion. Every license of marriage, probate of will, and all other ecclesiastical acts according to the Church of England; in fine, the Protestant religion is as eight to one, the Romish, in Montserrat, six to one Protestant and no Quaker, for they won’t let any live among them. The Quakers’ singularity and obstinacy have given the Governor more trouble than any others, not content with the peaceable enjoyment of what they profess in their families, they meet and once disturbed a Minister, for which they were imprisoned and fined, and have since been quiet. They will neither watch nor ward against the Caribbee Indians, whose treacherous and barbarous murders, rapes, and enormities discourage the planters in the Leeward Isles more than anything else. As to instruction in the Christian religion, churches, and Ministers, and their maintenance, the poor, and whether any beggars or idle vagabonds: The Ministers preach the word of God, parents send their children to some few schools, and Ministers catechize great and small. In all ten churches, in St. Christopher’s two, Nevis four, Montserrat two, Antigua two, in the other islands none; five Ministers in all, one not in orders, six more good ones would be sufficient; their maintenance is 10 lbs. of sugar per poll, white and black, besides what is given at marriages and funeral sermons. In proportion to the number of parishes fifteen Ministers are wanting, besides one each for Statia, Saba and Anguilla, but indeed ten or eleven are more than can be handsomely maintained by all the islands, so that six, with what we have, is enough. Collections are made for the poor, and by an Act parishioners are also rated, to which all voluntarily submit but the Quakers, whose goods are sold for payment of said rates. No beggars or idle vagabonds, for all who can are obliged to plant and work. 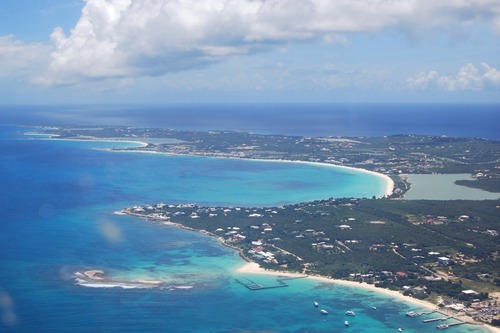 The beautiful island of Anguilla with its world famous beaches was once mentioned in the same breath as Saba and Statia as we were part of one Federation.